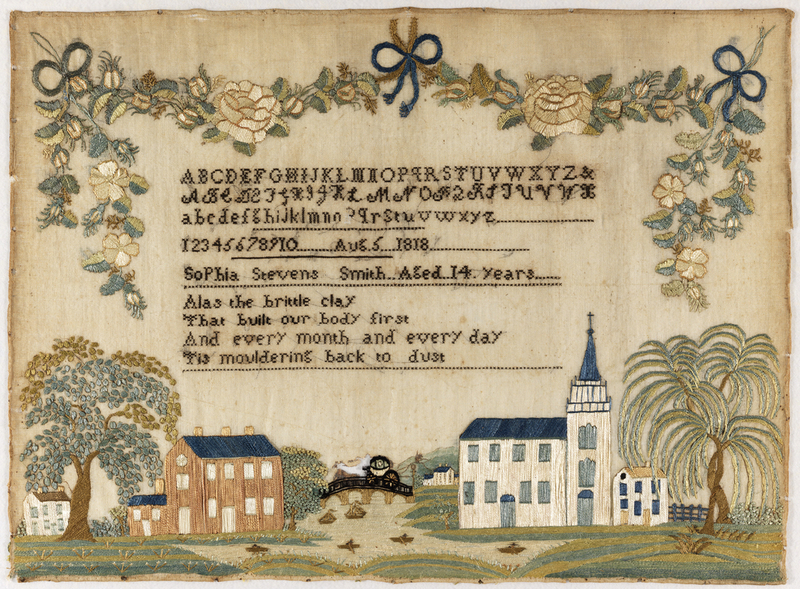 Sophia Smith’s sampler is part of a distinctive group of Wethersfield, Connecticut, samplers made at two different schools during the first quarter of the nineteenth century. Earlier examples were probably worked at the Abigail Goodrich School, which operated from around 1804 to 1815. Sophia’s is one of a later group of samplers, most likely made under the instruction of the sisters Charlotte and Mary Porter Butler, who opened a school around 1815 and may have been joined by Abigail Goodrich. The sisters were former pupils of Goodrich, and had also attended the Misses Pattens’ school in Hartford. Samplers attributed to the Butlers’ school include elements of those made at both of their former schools. Sophia’s work features motifs found on several other Wethersfield samplers, including a depiction of the town of Wethersfield that features the Connecticut River, houses, and the First Church of Christ, as well as two trees with intertwined trunks, and a garland of naturalistic flowers secured by bows. In some examples, the floral garland is held in the beak of an applied paper eagle. Two closely related samplers, both in private collections, were made by Elizabeth Cooke Crittenton (1806-1885) and Lucy Ann Hanmer (1806-1884). All three examples were worked in 1818 and have strikingly similar verses, garlands, and townscapes. Sophia Stevens Smith, born in Wethersfield in 1804, was the second child of Allyn Smith (1771-1839) and Rebecca Baldwin (1779-1876). Their other children were Caroline Crosby (1803-1814), Morgan Hills (1806-1828), and Porter (1815-1838). Sophia never married. After the deaths of her siblings and father, she resided alone with her mother, who lived to the age of ninety-seven. According to 1850 census data, Sophia earned her living as a “tailoress.” She died in 1881 at the age of seventy-seven.